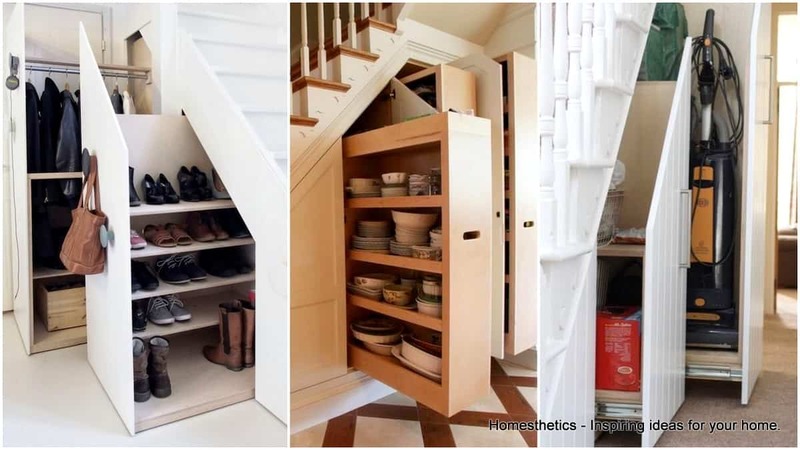 18 Useful Designs for Your Free Under Stair Storage | Homesthetics - Inspiring ideas for your home. Lacking space at home is a dilemma that most owners may face especially when there is simply no option of building an additional room and while others have attics to a use for storage, the use of under stairs have become a popular choice for the ones that do not. It is an ideal and ingenious way of utilizing the spare space under the stairs, not to mention a lovely addition inside a home. 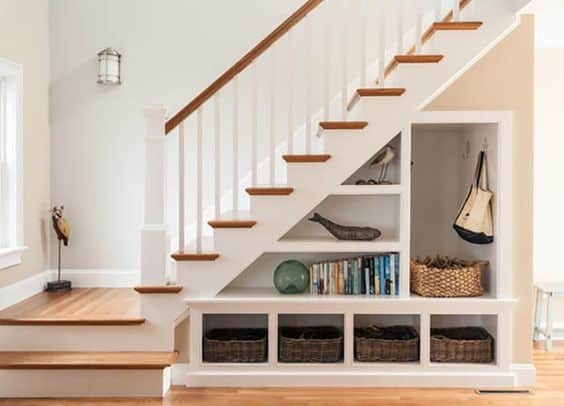 If the need arises for any additional storage at home and if the space under your stairs may be available than here are some clever and attractive under stair storage designs that you will surely find inspiring. 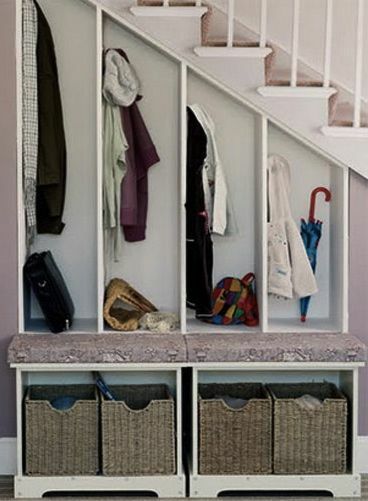 Under stair storage can be as simple as having compartments that can fit items to be stored. 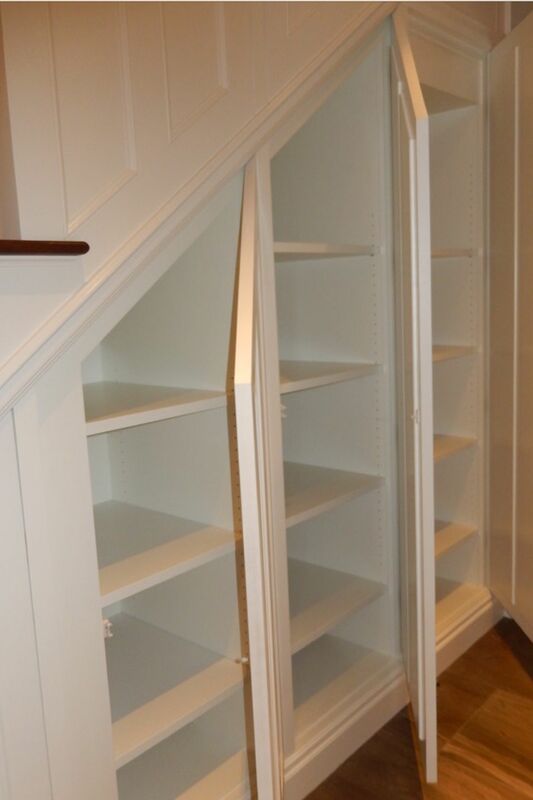 These compartments can be concealed by cabinet doors that fit the shape of the under stairs. Even with plain white paint these useful under stair storages can be just as lovely and useful as any customized cabinets. Having immense drawers able to slide outwards and unravel an immense collection of jackets and shoes would be insanely practical, how do you see it ? Storage areas do not need to be boring or less attractive. 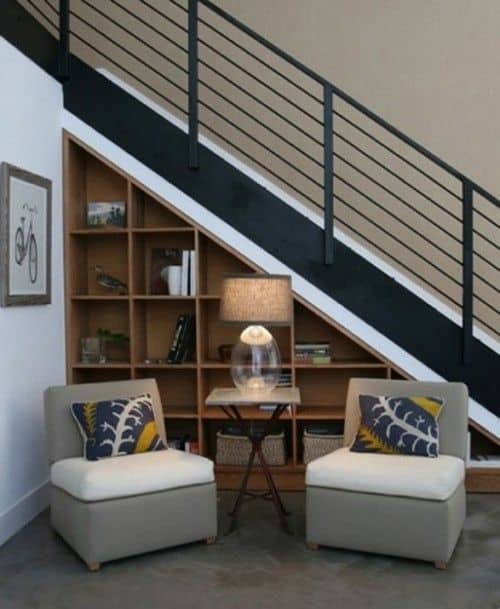 This under stair storage design hits two birds with one stone- having an area that can be used for storage and a reading area inside the home. 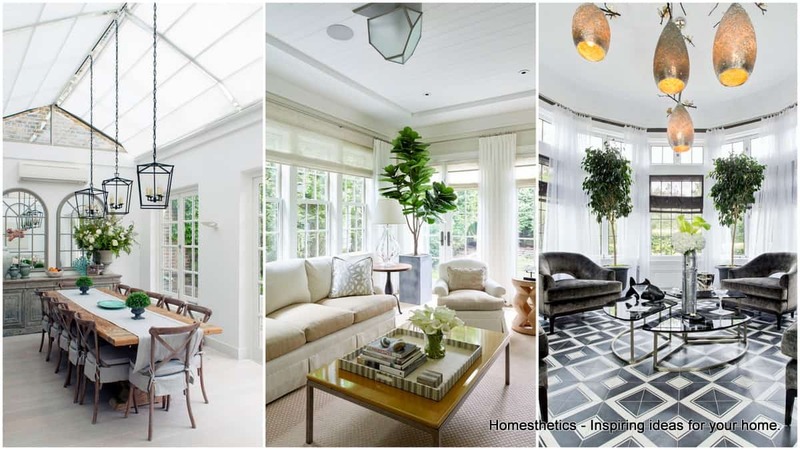 This idea is a great way of maximizing all the space while complementing the whole interior design of a home. Not all homes have proper storage areas big enough to hold large cleaning equipment and materials. 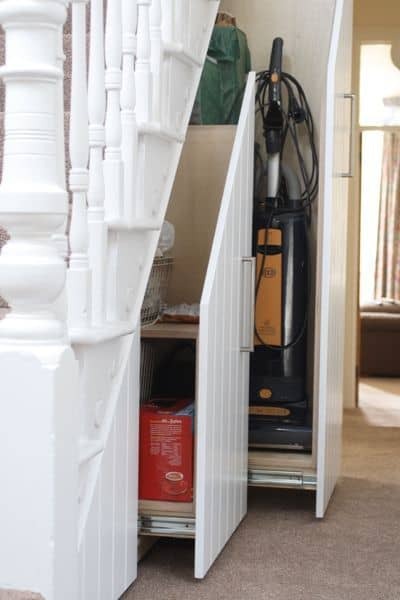 This under stair storage can hold big cleaning items inside a home and still have space for other cleaning items. The storage is also very discreet, making it perfect for people who do not want to let anyone else see where the cleaning items are. 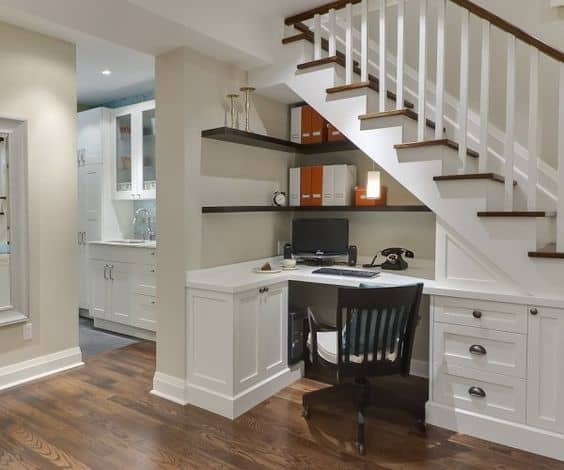 Storage areas under stairs can go for drawers but having draw out racks can also be an option especially for people who want to have more than drawers and/or compartments for under stair storage, people that need this area as an open display to showcase various items. 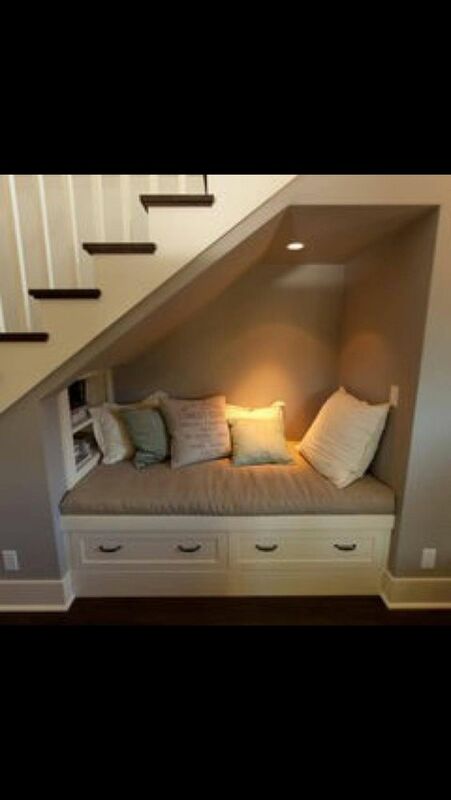 This is also a lovely change and a way to revamp for those who already have an under stair storage. 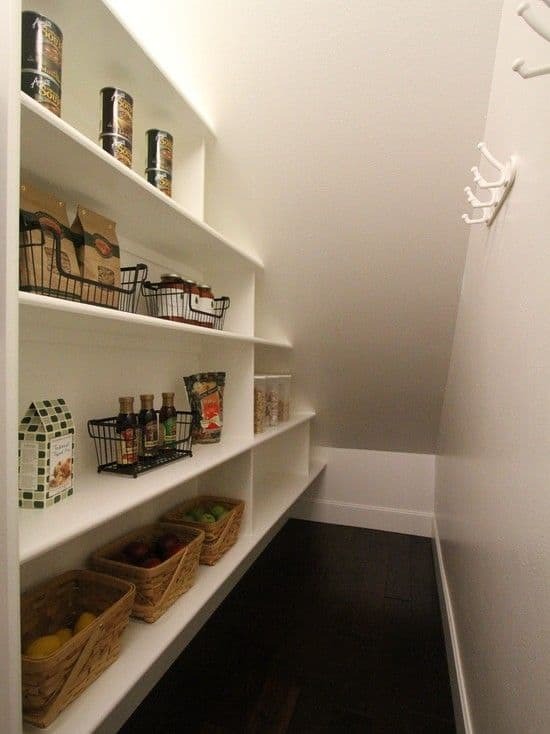 The kitchen is not the only place where cupboards can be found, under stair storage is also a perfect place to store food and keep the stash for the rainy days in a safe and accessible place. 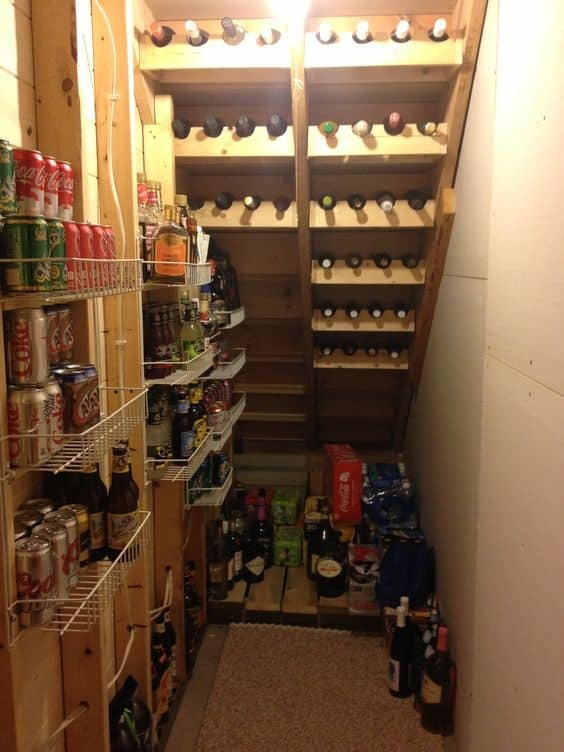 Wine storage inside a home may not be always an option especially with restricted home space. Having this wine and beverage storage is genius and can be an amazing part of any home that guests will truly envy. 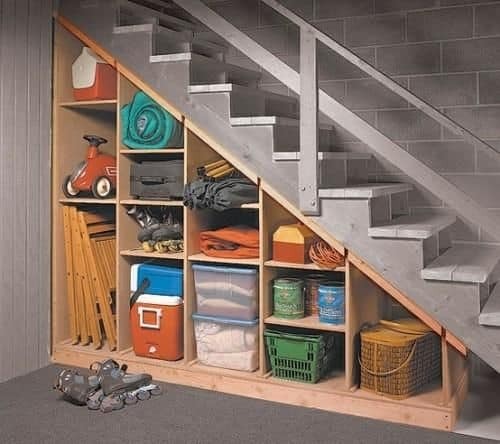 Under stair storages are mostly used for items that can be seasonal but it is also great for items that are used every day. With clean, white and mold free interior and spacious shelves, this can be the perfect storage for fresh produce and other dry foods used for everyday meals. Drawers are very common way of designing a storage, but it is not always the most practical option. Having just shelves can be a great alternative to having drawers. These shelves make use of all spaces and the woven baskets add as lovely and useful decoration for the under stair storage. 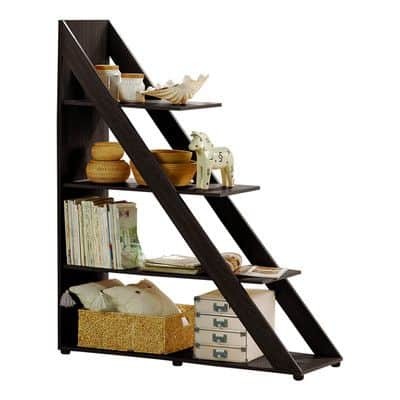 This under stair storage design is perfect for people who want to organize personal items as much as possible. It gives enough space for each individual and can hold items that are used every day. A grab-and-go design that is perfect for a busy household. 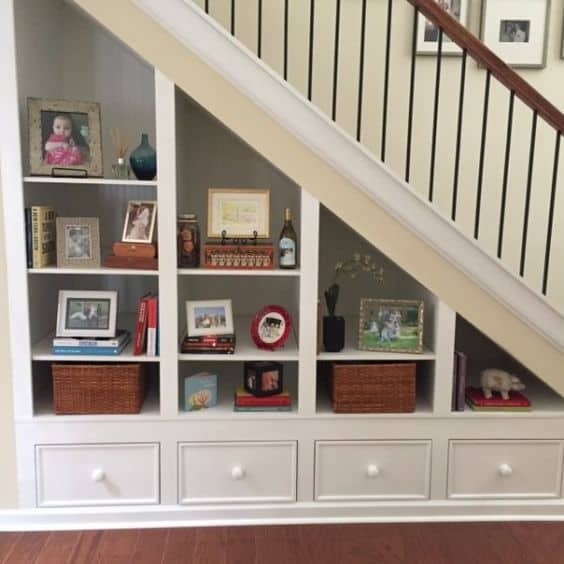 While drawers, shelves, and cabinets are common under stair storage, combining these three and adding more function to the under stair storage is just as lovely. 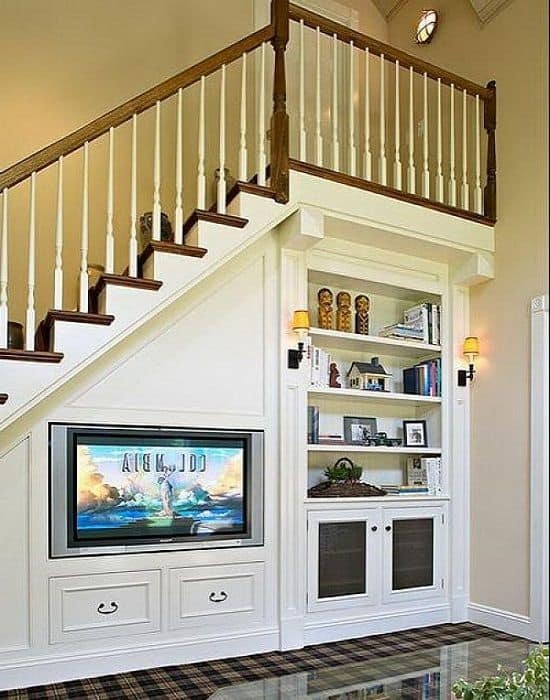 This idea for under stair storage with TV rack gives more space for other furniture and also have space for other decorations at home. This is perfect for apartments or homes that have small living rooms. There are homeowners who would want to have their own space as an office or work area. When space is limited, using the under stair space can be a wise and beautiful option. It adds aother functional area of a home and more storage area for important items. The idea is also stunning even with its limited space. Creating a library may not be possible for most homes and having bookshelves can take up space that can be used for other items or furniture inside a home. Using the under stair is a perfect use of spare space and have a mini library at home. The under stair bookshelf can be filled with more than enough books and magazines for any bookworms. 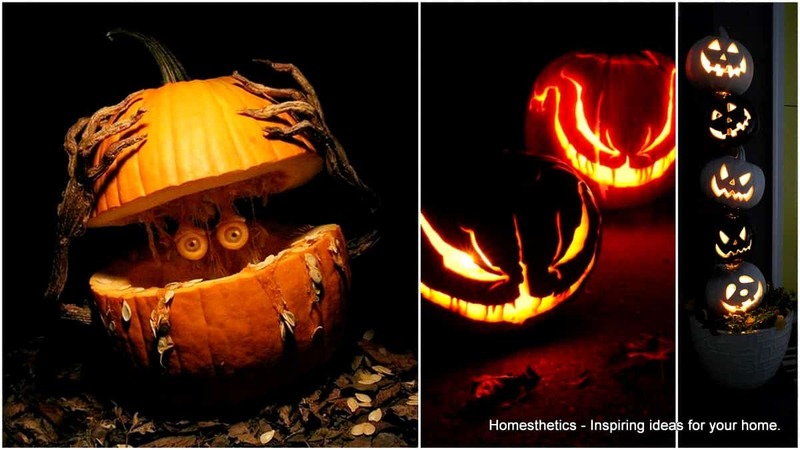 There are some decorations and little displays that define a home and give a personal touch. The under stair can be a perfect place to place these photos, personal knick knacks and decorations. Adding small drawers gives more room for storage of items that are needed inside the home. 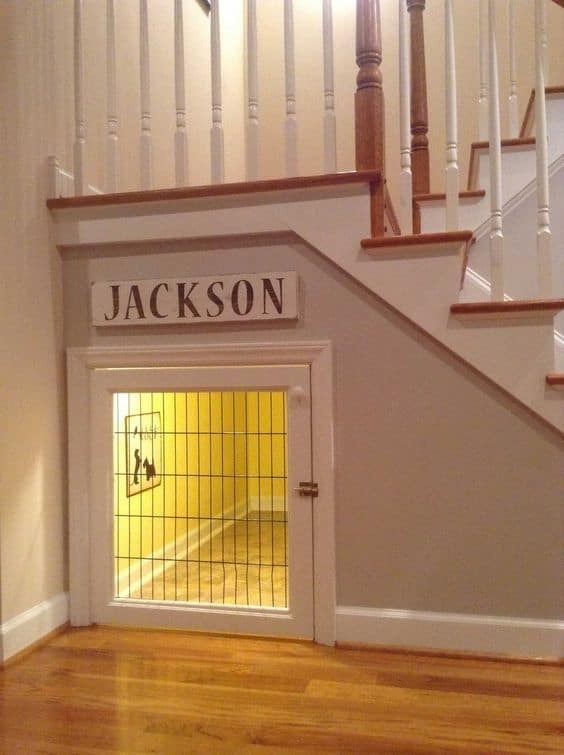 Pet sleeping areas may also take some space. 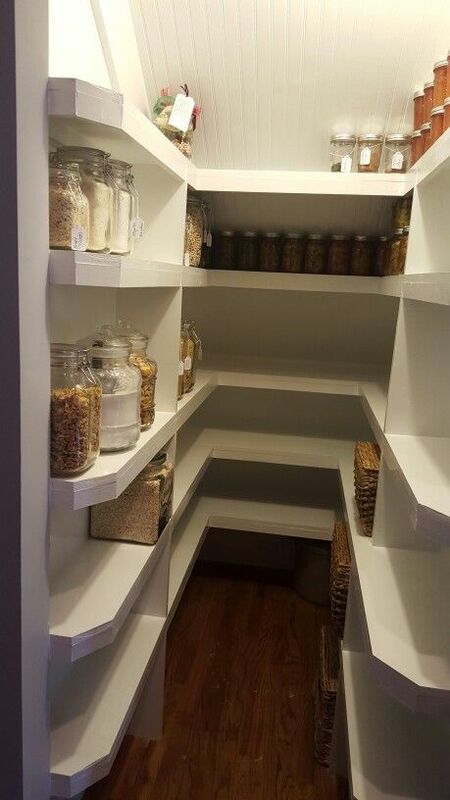 Though this is not a typical storage idea, this is unique and gives space to pets. It is a perfect way to keep pets tucked in while keeping the whole home in order. Fragile items at home, such as plates and bowls, can easily be stored inside the under stair pull out storage. The storage is strong enough to hold fragile items and big enough to have space on multiple layers for numerous items. The setup also looks modern and can be a great addition inside a home. Most of the time, spaces under the stairs are not used or left empty and do not necessarily look appealing for the rest of the interior design. 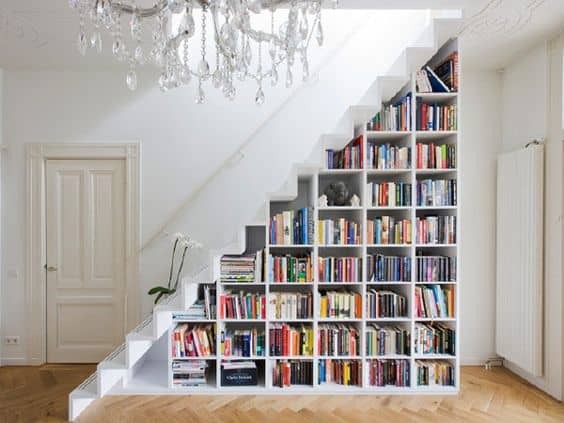 Creating shelves and storage or compartments under the stairs where books and other small items can be placed allows it to look more attractive. Add cozy chairs and the under stair storage becomes a perfect backdrop for a reading corner. Having a place for seasonal items that can be accessed easily and in an organized manner can be done by having under stair storage. The compartments are big enough to hold items big and small. This type of storage also creates a discreet space where items can be pulled out anytime when needed or in season. While the simple designs may not be extraordinary solutions they are insanely useful and they will definitely make your everyday life easier. 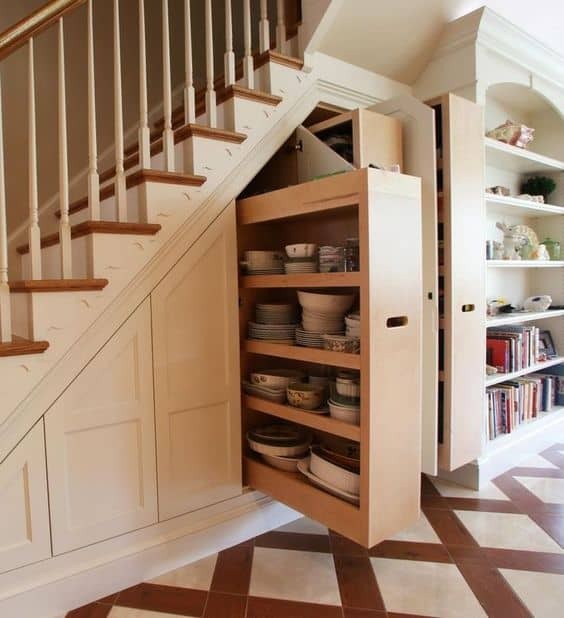 What do you think about them and how do you use the under stair storage ? We would love to hear from you !